Darfur has long been plagued by significant droughts, however in 2007 scientists at Boston University discovered the region has one of the biggest underwater lakes in the world. Putting these two facts together, Polish firm H3AR designed an incredible water-harvesting skyscraper that would draw h2o from underground and create an artificial lake! Darfur’s underground lake covers a distance of 19,110 square miles and has the potential to restore peace to a region ravaged by drought, however providing access to all that water has proven difficult. 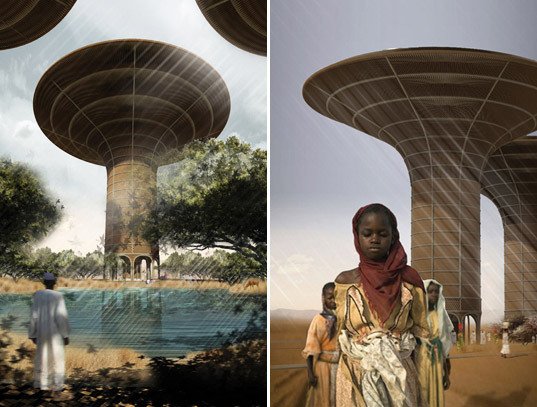 H3AR‘s Watertower aims to tap this resource through good design and effective water management. The skyscraper would work as a hospital, a school, a food storage center, and most importantly, a water storage center. 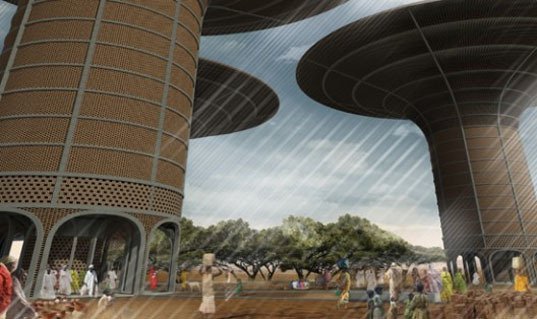 The building resembles a baobab, the “upside down tree” from the Savanah, and it houses water pumps and a treatment plant. These pumps take the water from the aquifer, pump it throughout the building to heat it and cool it, and store it within the core of the building itself. The building’s users would then have access to this water, which would be recycled by the treatment plant. H3Ar’s plan calls for three towers to be built. The towers would be constructed from stacked dry clay bricks, which would be manufactured on site. Why bricks? They can be manufactured locally, are a sustainable building material, and are tied to the local community. The bricks would be made with a mixture of earth, cement, and water. The shape of the towers provides shade on the ground, stabilizing the microclimate, and between them an artificial lake would be created. This artificial lake would further assist in creating solace amid the harsh African environment. H3Ar, have certainly created a very cool design to solve an extremely difficult problem. While still a concept at the moment, the project provides a reminder that good design can have far-reaching consequences. How much for just one to get the ball rolling more like in other places with some resources. If they were made out of bricks what would hold the water within the building? It would need to be reinforced with steal I would imagine. That much water pressure, depending on the volume of water would put a lot of stress on those bricks. Seems like a neat idea - but the guy above might be right. Well's might be more realistic. I know nothing about the area though. Id like to know more about the project. I believe you mean underground lakes instead of "underwater lakes" Very interesting article. ...and all H3AR needs is a rich western government to underwrite their solution in search of a problem. The cost to benefit ratio for this project is unsustainable. And inhabitat knows this - we've seen this design on the blogs in other contexts. A better solution for every money spent would be providing standard deep wells to supplement individual family cisterns, and low water use gardening technologies. It's an interesting design, but how many people will it help on a daily basis and what is the cost per person effected? If it's more than a hundred dollars per individual, I doubt that it's cost-effective. Darfur's underground lake covers a distance of 19,110 square miles and has the potential to restore peace to a region ravaged by drought, however providing access to all that water has proven difficult. 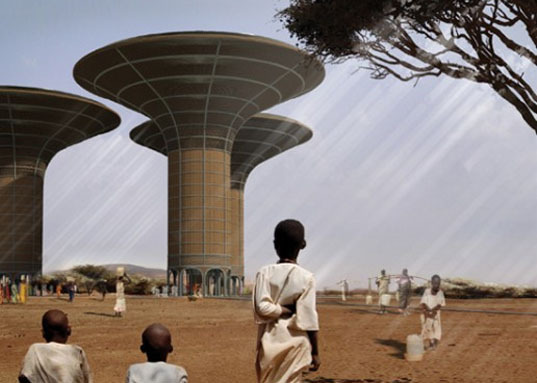 H3AR's Watertower aims to tap this resource through good design and effective water management. The skyscraper would work as a hospital, a school, a food storage center, and most importantly, a water storage center. The building resembles a baobab, the "upside down tree" from the Savanah, and it houses water pumps and a treatment plant. These pumps take the water from the aquifer, pump it throughout the building to heat it and cool it, and store it within the core of the building itself. The building's users would then have access to this water, which would be recycled by the treatment plant. H3Ar's plan calls for three towers to be built. The towers would be constructed from stacked dry clay bricks, which would be manufactured on site. Why bricks? They can be manufactured locally, are a sustainable building material, and are tied to the local community. The bricks would be made with a mixture of earth, cement, and water. The shape of the towers provides shade on the ground, stabilizing the microclimate, and between them an artificial lake would be created. This artificial lake would further assist in creating solace amid the harsh African environment.